Just a quickie post today. Here are four great, rare tracks by Philadelphia's favorite sons, Marah, from a CD single and a promo EP from their awesome Kids in Philly album. If you don't know these guys, they are rock 'n' roll poets and true believers. The stompin' cover of Springsteen's "Streets of Philadelphia" is fun, the song about indie record shops brings a smile, and the two live versions of Kids tracks are smokin'. Meanwhile, here are three live tracks from the Blue Plate Special EP released around the time of the first Grant Lee Buffalo album, Fuzzy. The version of Elvis' "Burning Love" is a hoot! The two album tracks on the EP are not included here. For that matter, neither is the "A" side of the "Point Breeze" Marah single. A short, sharp shock of American rock, courtesy of Philly and Silverlake! Link in comments. 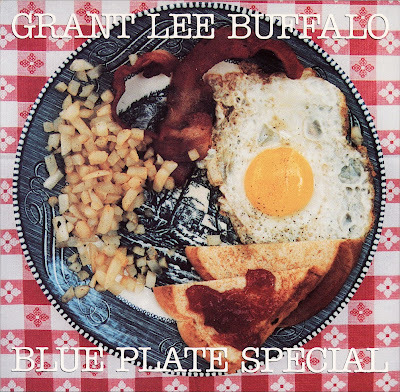 Grant Lee Buffalo is a sleeping giant that will wake up someday...don't worry, they are already no more. But, honey don't think about it too long...this is what superslowmotion feels like. Marah, came to me via Point Breeze on a comp. They really love the boss (if flattery is any indication). The album in question was also found to be suprisingly good. So, you get East or West here and now. It's Philly vs. Newhall... Vrooom. Thanks for remembering these two great ends of the spectrum. Shiva's Burlesque anyone? Thank you, Pop!